Hand cut modern lamps and sculpture made of fine woods and recycled white plastic, carved into interlocking pieces of flowing curves, his designs of light and shadow reflect and fill the negative and positive spaces. Mark’s art is his passion, his daily practice, and his meditation. A long time resident of Honolulu, Duffett has an extensive resume and specializes in both large scale public commissions and fine art sculpture. He is best known for his twice life size work, “Kaha ka ‘Io me na Makani”, the three, iconic, hula kahiko dancers fronting the Hilton Hawaiian Village. Duffett's artistic styles vary greatly, ranging between the representational to abstract. For further information, artist's resume, current prices, purchases, or to discuss commissions, contact us directly. My sculptures have been described as having a whimsical yet surreal presence. 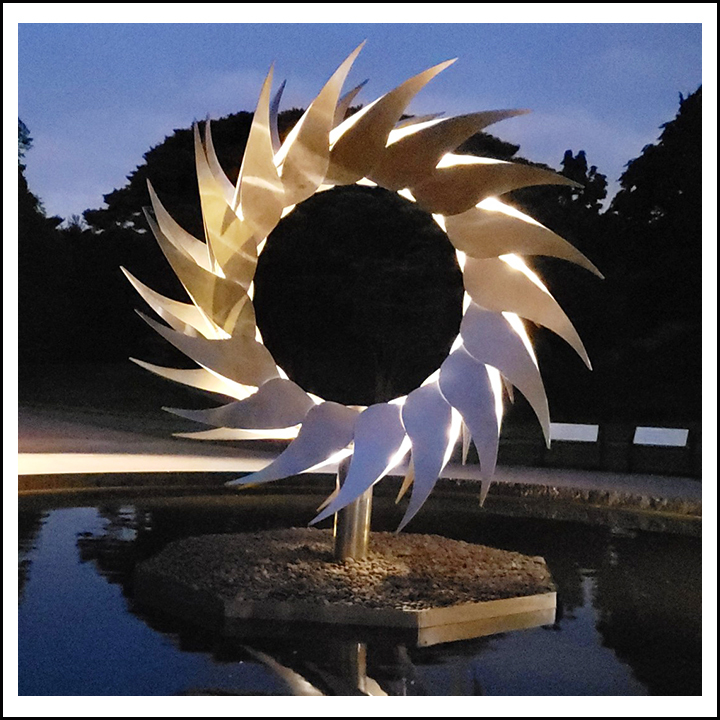 Constructed of many different materials including hand-built concrete, ceramic or cast bronze, these works are showcased in private homes and corporate and public environments throughout the United States and Japan. I received my MFA in sculpture from the University of Hawaii at Manoa in 1996. Some of the most interactive sculptures are "What's Next" , (Hawaii's most well-known bus stop rider in front of Bank of Hawaii), and "Tubers", made up of three bulbous floaters in inner tubes on the City Hall Park block. Lynn Weiler Liverton graduated from the University of Arizona with a Bachelor’s of Architecture degree in 1988. After practicing Architecture in Boston and Honolulu for 4 years, she went back to school to earn a Master’s degree in Fine Arts from the University of Hawaii in 1996. Balancing her time between teaching and working as a professional artist, one of Liverton's artistic passion's is based on memorializing individuals. Her monumental sized bronze sculpture's can be seen throughout Hawaii and the mainland. As a Hawaiian, Schiessel is interested in using glass to contemporize forms of traditional Hawaiʻi and to introduce the material into the art historical context of his culture and home. His material use of glass aims to highlight the fragile state of Hawaiian culture, as well as the hybridity of culture in Hawaiʻi nei, as Western pedagogy has privileged him means of investigating the material and its history. With an emphasis on both aesthetics and conceptuality, Schiessels' work is exceptionally unique. Jonathan has been crafting art for 18 years developing facility in a variety of media with a focused refinement in the glass techniques of blowing, casting, carving, and sculpting. He has worked with exceptional artists across Europe and the US, including Paris, Venice, Copenhagen, New York, Seattle, and Chicago. He has completed extensive commercial and residential architectural commissions throughout the United States and has numerous works in permanent collections all over the world. George has been an artist and teacher living in Hawaii since 1977. He is known for his versatility and inventive style of working in a variety of media. He has had 28 solo shows and has been in approximately 320 group, invitational or juried exhibitions. Venues have included galleries and museums in France, Germany, Italy, Norway, Finland, Korea and Japan as well as spaces in New York, Chicago, Los Angeles and Honolulu.